The big show, Labor Day 2011. 44 years and counting, and this year, streaming live worldwide. Like many of our fellow Brooklynites, the lady and I loaded up on booze and weathered the hurricane in relative tranquility - the sometimes-leaky roof held up, the power stayed on, and being up on a hill (it's Crown "Heights" for a reason), we were spared most of the flooding, though the morning commute is going to be a disaster. With the forced relaxation of the MTA shutdown upon us, I took the time to do a little thinking about the twenty-year anniversary of the Crown Heights Riots, which passed with some fanfare last week. Though this is a Crown Heights blog, I'd been silent so far because a) I was out of town, b) as a recent arrival, I wasn't around for the riots and can't contribute much in the way of a personal reflection, and c) on account of the first two circumstances, I wanted to digest the coverage before throwing my own two cents into the mix. For those who missed it, a few pieces that made waves: Al Sharpton and Norman Rosenbaum (the brother of Yankel Rosenbaum, who was murdered by a mob during the riots) traded remembrances in the Daily News (Sharpton's is here, Rosenbaum's here), and Sharpton stepped down from a panel discussion in the Hamptons about the legacy of the riots after Rosenbaum protested his involvement. Former New York Times reporter Ari L. Goldman criticized his former employer for their coverage of the riots in a much-blogged article in The Jewish Week. The Jewish Daily Forward produced a video essay about the neighborhood, which suggested that while tensions have cooled and organizations now work to bridge gaps between Lubavitchers and Afro-Caribbean/African-American residents, the two communities remain largely separate (below). Living Apart in Crown Heights from Jewish Forward on Vimeo. Thinking critically about rioting is a challenge, as the recent disturbances in London made clear (a few of us had a chat about the comparison between CH and London on this thread, which I won't go into here). There are those who want simply to dismiss riots as the work of criminals or hatemongers, and who take any attempt to analyze underlying social conditions as "justification" for violence, death, and the destruction of property (this was the official Tory line throughout the week of rioting in London). It seems more likely, however, that criminals and hatemongers, of the sort who gleefully looted local London shops or shouted neo-Nazi slogans in Crown Heights 20 years ago, are not facilitators of unrest but opportunists who take advantage of anger, violence, and mob dynamics (riot opportunism has a "respectable" face as well - one of the most lasting citywide legacy of the riots is the way in which politicians across the political spectrum, from Anthony Weiner to Rudy Giuliani and most recently, Mayor Bloomberg, have deployed the spectre of rioting to win elections). Unless you can truly convince yourself that everyone who rioted in London was a born criminal, or everyone who rioted in Crown Heights was already an active anti-Semite, understanding a riot requires more investigation. Commentators of all stripes offer explanations: inequality, lack of economic opportunity or political voice, family breakdown (the Daniel Patrick Moynihan answer), the "urban crisis," the end of the welfare state, the welfare state itself, and so on and so forth. What all of these answer have in common is the idea of a stake in, access to, or membership in society. Such a stake can come from many places - from a tightly-knit family or community, access to quality education, health care, or other social services, from "civil society" (clubs, unions, businesses), from religious institutions, from a sense of political empowerment or economic opportunity. It's when all of these structures fail (and they are not independent - the failure of one affects another) that the sense of being "left out," and the anger, resentment, and hopelessness that come with it, arises. This isn't to say that such a feeling "causes" or explains rioting (or justifies violence or hate) - the individual dynamics of any such event are far more complex - but that the lack of a stake seems to be a frequent and significant pre-condition. Last Saturday, August 20th, when many of the commemorations took place (speaking of which, nice write-up of Crown Heights Gold in the NYTimes), I was in Chicago for the 50th Anniversary of the Rainbow Beach Wade-Ins, a nonviolent direct-action protest that integrated Chicago's beaches during the summers of 1960 and 1961 (there are two great historical pieces on the wade-ins here and here). At the event itself, Velma Murphy Hill, the organizer of the first wade-in and a lifelong civil rights leader, rose to recount the events of fifty years past, and then took a moment to address the present and future. Murphy Hill offered three prescriptions for meeting the challenges that face communities like Chicago's South Side and Crown Heights today. First, she said, "learn the issues." Noting that issues of economic opportunity are "more complicated" than segregation, Murphy Hill put education and information, both for leaders and those they hope to serve, at the top of her list. Second was "building coalitions," reaching out to diverse groups to achieve goals (the wade-in commemoration itself evidenced this - several major unions, religious groups, civil rights organizations, and local politicians came together to make the event happen). Finally, said Murphy Hill, citing the lessons of her mentor A. Philip Randolph, action must be direct, and it must be non-violent. Velma Murphy Hill wasn't speaking of Crown Heights, but she very well could have been. She was calling for a renewed effort by people from all walks of life to build coalitions and movements for justice and opportunity, movements that themselves provide a sense of a stake in society and access to levers of power. On August 20th, recalling a civil rights struggle and a riot, it struck me that if we hope to avoid the latter, we need more of the former. Educate, unite, and act directly but peacefully for justice; may we, and our leaders, heed Murphy Hill's advice. 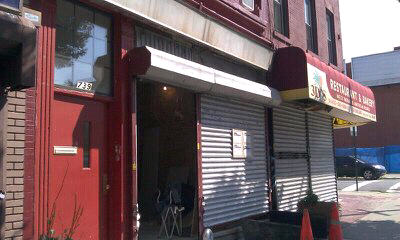 Workers putting up drywall at 739 Franklin reported that the space will be a bar and restaurant. Said one, with a wave of his hand toward the street "y'all are going to drink a LOT." The election of judges is one of the least-understood and (perhaps as a result) most scandal- and nepotism-plagued parts of our political system in Brooklyn. Prospect Heights Democrats for Reform, a local reform organization that hopes to challenge the county machine's traditional control over these offices, is hosting a candidate forum tonight at LaunchPad. Click on the flyer or read on for more information. Will you be an informed voter on September 13th, 2011? Voting shouldn’t be a spectator sport. Summer is winding down, but there's still plenty to do around the neighborhood this weekend, provided Hurricane Irene doesn't hit us too hard (Crown Heights, being up high, is not an evacuation zone, but if things do get hairy, be prepared to host your buddies with ocean views). - Provided it isn't washed out, the Walt L. Shamel Community Garden, on Dean between Franklin and Bedford, hosts its annual Art Fair on Saturday afternoon from 1 - 6pm. - Also on Saturday, he Owl and Thistle General Store hosts a "Grand Opening" celebration from 11am - 8pm, complete with local artisans in-store to promote their wares, food and drink samples, and a Kid's Coloring Contest. They got a nice write-up from Time Out NY recently - check them out. - Finally, weather permitting, the always-awesome (and FREE) AfroPunk Festival returns to Commodore Barry Park up in Fort Greene on Saturday and Sundy, with Cee-Lo Green closing the show. Hurricane, shmurricane - it's Cee-Lo for free (yo)! Tonight, check out Brooklyn Unplugged at Franklin Park, while tomorrow night, the Kings County Cinema Society offers a free triple bill at LaunchPad. 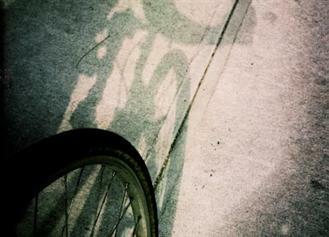 Brooklyn premiere of BIKELORDZ (2011, 16min) directed by Mikey Hart. “Bikelordz is a short documentary about the self-taught, self-invented bicycle culture that kids in Ghana have created. It follows crews of these young BMX gurus as they try and use their skills to make money, gain recognition and live on their own terms. Filmed on the streets of Accra in 2007, Bikelordz features a soundtrack of all Ghanaian music and shows a side of the city never before seen beyond its limits." Trailer and kickstarter campaign here. Introduced by Bikelordz editor (and KCCS captain) Tobias Arturi. Followed by a showing of Native Sun (2011, 21min) a wild and visually stunning short film/ music video shot in Accra and rural Ghana. Directed by Terence Nance and Blitz the Ambassador, the film follows Mumin, a precocious young boy who makes the long trip to Accra from his home in the Ghana’s rural northern region. Featuring music from Blitz the Ambassador’s second full length album. From Brooklyn-based Media MVMT. Gotta see this one on a big screen. Finally: West to Dakar for BADOU BOY (1970, 56min) a fantastic French New Wave-influenced coming-of-age story and the debut film by Senegalese master and celebrated experimentalist Djibril Diop Mambety (Touki Bouki, Hyenas). "A sarcastic look at Senegal's capital that follows the adventures of what the director described as a "somewhat immoral street urchin who is very much like myself." The contest pits the non-conformist individual against an absurdly caricatured policeman who pursues the protagonist through comedically improbable scenarios. Badou Boy celebrates an urban subculture while parodying the state." Check our site for a truly great trailer, from African Film Library. At LaunchPad, our home the fourth Wednesday of every month. Wednesday at 8pm, FREE, popcorn provided, BYOB. total program: 93min | digital projection | programmed by nick shimkin | produced & hosted by david woodard jr.
**Just added: Brooklyn-based photographer Anderson Zaca will start off the night by introducing his kickstarter campaign for Block Party: Soul of Summer - an awesome project that aims to document and celebrate the city’s block party culture through beautiful b/w photography. Get a beer and get there on time and consider supporting this one with $$ - we love this project. A night with Plug Ugly Films: Director Michael Sladek (fantastic recent art doc “Con Artist”) will bring a handful of short films, music vids, and other odd bits of cinematic excellence from the Bk-based production company. Wed. 9/7 9pm at Freddy's Bar and Backroom, 627 5th Ave. btw/ 17th & 18th St.
Chavella's is Gone, Long Live Chavela's! For many folks in the area, today is a sad day, as today Chavella's, the hugely popular teeny-tiny Mexican joint on Classon, shut its doors for good (reported first on Brooklynian). However, folks will still be able to enjoy all their favorites from Chavella's, as well as margaritas on tap and a full bar, at Chavela's, the new place with the almost-same name from the same owners at 736 Franklin Avenue. Five months to the day after they originally planned to open, Chavela's will finally start serving this Wednesday, August 24th, at 11 AM. ILFA did a Q&A based on a conversation with the owners back in March, and the plan remains the same - lots of the delicious Mexican food you expect from these guys, with a few new twists, more seating, and great drinks. As for the old location, it's not going to be out of commission for too long. Despite an epic hassle with the NYC Department of Buildings to get the new location open, they plan to clean out, renovate, and re-open on Classon at some point soon with fresh and tasty ideas. WHAT: Prospect Heights will come alive with local art, flavors, live music, and fashion at the second annual Wash Ave Rocks! Street Fair on Saturday, August 20. Brooklyn-based food bloggers will crown the best appetizer in Prospect Heights at 1pm; a fashion show featuring Brooklyn-based models and designers will take the stage at 4:30pm; and cultural organizations including Brooklyn Museum, Music Brings Life, and Brooklyn Children’s Museum will lead family-friendly activities throughout the day. THIS EVENT IS RAIN OR SHINE. WHO: Wash Ave Rocks! is hosted by the Washington Avenue-Prospect Heights Association (WAPHA) and over 1000 attendees are expected. Participants include local restaurants, shops and 20+ vendors. A Children’s Corner with a water slide and face painting, the New York Blood Center, Music Brings Life, The Green Bus, Brooklyn Museum and Brooklyn Children’s Museum will be on site throughout the day. WHY: Wash Ave Rocks! showcases Washington, Classon & Underhill Avenuebusinesses in a free, fun event for families. foodies and fashionistas alike. Please note: This month's reading is on the THIRD MONDAY of the month -- just a rare exception. This month it's all about "Missed Connections" -- miscommunications, longings, and wrong directions. The situations include a 10-year-old lost in an alternate heaven, young New York transplants trying to negotiate a disorienting city, and an elderly man grieving over the impending death of his longtime lover. MICHAEL KIMBALL is the author of four books, including Dear Everybody (which The Believer calls “a curatorial masterpiece”) and, most recently, Us (which Time Out Chicago calls “a simply gorgeous and astonishing book”). His work has been on NPR’s All Things Considered and in Vice, as well as The Guardian, Bomb, and New York Tyrant. His work has been translated into a dozen languages and he is also responsible for Michael Kimball Writes Your Life Story (on a postcard), the 510 Readings series in Baltimore, the documentary 60 Writers/60 Places, and the conceptual pseudonym Andy Devine. His new novel, Big Ray, will be published by Bloomsbury in Fall 2012. AMY BENFER has written essays, reviews, and reported stories for Salon.com, the New York Times Book Review, the San Francisco Chronicle Book Review, Kirkus Reviews, Glamour, Mother Jones, and the Believer. She has been an editor at Salon.com, Legal Affairs, and Paper magazine and was a regular contributor to Salon.com's feminist blog, Broadsheet. Currently, she writes a column for Jane Pratt's new Web site, xoJane.com, and a column on young adult fiction for the Barnes and Noble Book Review. ROBERT TUMAS is a writer and grad student who lives in Crown Heights with his gorgeous wife and their two dogs. His writing has appeared in The L Magazine, Slant Magazine, The Faster Times, and The Rumpus. His fiction has appeared or is forthcoming in ‘stretch’ Magazine, Puerto del Sol, and Vol. 1 Brooklyn. He is currently at work on a novel about growing up New Jersey. Check out this fascinating new project from local filmmaker Jan Weber, who's already put together one film on the topic (and who also made a fabulous video of the Kids Day last year). Check out the blurb below from her website, and if you like the project, consider becoming a supporter on Kickstarter. To find the answers, Jan will drive some 5,000 miles visiting and revisiting farms of every kind and size—from 6ooo acres of cotton to 6 acres of organic vegetables, from 80 grass-fed cows to a dairy that milks 32,000 cows a day, from 30 free-range sows and their piglets to 3,000 hogs in confinement—talking to farmers and ranchers about their choices and about their lives. Farmlandia will grow into an hour-long documentary that combines archival footage shot over the course of a decade with new footage to be shot in the summer and fall of 2011. Dexter Wimberly, curator of this summer's Crown Heights Goldexhibition, will moderate a lively, unscripted Artist Talk featuring Fiona Gardner and Kenya (Robinson). With Wimberly as host, these two dynamic artists will be interviewed simultaneously in an unrehearsed, spontaneous "talk show" format. They will discuss their artistic practices and their new performance piece, which was created collaboratively for the Crown Heights Gold exhibit. This program will take place in BHS's first floor program space and is free and open to the public. Fiona Gardner is a New York based artist/photographer. She received a BFA in painting from Rhode Island School of Design in 1999, studied at the New England School of Photography, and graduated with an MFA in photography from Columbia in 2004. Since 2006, she has worked at The New York Times Magazine. Her work focuses on the lives and experiences of women. Her work has been exhibited in New York at the Black & White Gallery, Rush Art Gallery, and Sean Kelly Gallery. Her work has also been shown in the Young American Artists of Today show in Moscow. Her photographs have appeared in The New York Times. She won the Agnes Martin Award for Outstanding Work in Columbia’s Graduate Arts Program and a Vermont Studio Center fellowship in 2003. Kenya (Robinson) is a self-taught artist from Gainesville, Florida. A past resident of the Lower Manhattan Cultural Council's WorkSpace Program (2009-2010) and the 2010 Triangle Arts Workshop, her sculptural work has been exhibited at The Museum of Contemporary Diasporan Arts, The Jersey City Museum, The Aljira Center for Contemporary Art and The 60 Wall Street Gallery of Deutsche Bank. In addition, her performances have been featured at The Kitchen, Rush Arts Gallery, MoMA PS1, The DUMBO Arts Festival, Recess Activities Inc., Cabinet Space and in the Home Section of The New York Times. She lives and works in Bedford-Stuyvesant, Brooklyn and New Haven, CT. I'm barely keeping up with the latest openings and closing from afar (Brooklynian has up-to-date dirt on these places and other soon-to-opens, including Barboncino, Neptune Diner, and Guero Tacos), but thanks to the readers who sent in photos. Also, Kevin from About Time is planning to use an unfortunate water-pipe disaster as an opportunity for a major renovation, and as usual, he's open to suggestions if you've got a great idea for how he might improve his storefront. Impact is the NYPD program that deploys foot patrol to communities in the City where the need is the greatest. We are asking EVERYONE to weigh in on this issue, NYPD needs to hear our voices or the Impact Zone will move to a more vocal community. 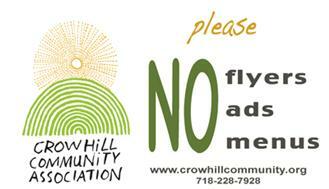 IF YOU HAVE NOT YET PARTICIPATED PLEASE VISIT http://crowhillcommunity.org/Impact.shtml TO ACT NOW!!! We have started a campaign to extend the existing Franklin Avenue bike lane that abruptly ends at Bergen Street. We are asking that Franklin between Atlantic and Eastern parkway consist of 1 traffic lane for cars and 1 bike lane, the parking lanes would remain as is. Hugh Carey, the Brooklyn-born Democrat who governed New York from 1975 through 1983 during the toughest fiscal crisis in state history, passed away today at the age of 92. You can read comprehensive obits at all the major news sites (WSJ, NYT, etc), but if you'd like a more in-depth look at what made Carey great, the book pictured above, The Man Who Saved New York, offers a good one (a book which I reviewed for the New York Observer last summer). 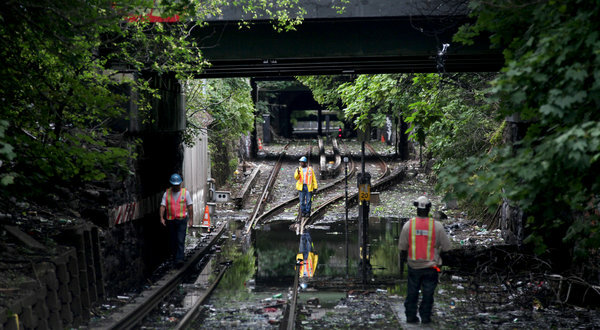 Carey's passing is a sad reminder of his successful rescue of New York City in 1975, which couldn't contrast more starkly with the current Congressional catastrophe. An independent Democrat who beat the machine candidate to the Governor's mansion (someday soon, New Kings Democrats, someday soon), Carey was able to walk a fine line between constituents and players that included businessmen eager to break the welfare state and union chiefs with a fierce desire to protect their pension funds and guaranteed raises. With the help of his political team, Carey brokered a solution that cut costs, raised revenues, and set the state budget on a relatively balanced track for close to a generation. It's no wonder that Andrew Cuomo passed copies of The Man Who Saved New York to labor leaders and others he'll be working with on the state budget when he took office. - Check out Anderson Zaca's show "Block Party: Soul of Summer" (photo above) at 1158 Dean Gallery, which got a nice write-up in the NYDN. - On Saturday, swing by Built in Brooklyn for locally-produced crafts and handiwork, from 12pm - 6pm at LaunchPad. - Later on Saturday, head over to Five Myles Gallery from 5pm - 8pm for the opening of "To Gather," featuring artwork by Erin Gleason and performances from hip hop duo DobleFlo, vocal artist Malesha Jessie, poet Lynne Procope, comedian Elon James White, and Erik da Barber. - Finally, on Sunday, enjoy free admission to all six of Heart of Brooklyn's institutional partners (The Brooklyn Museum, the Brooklyn Botanic Garden, The Brooklyn Children's Museum, The Prospect Park Zoo, The Brooklyn Public Library, and Prospect Park). Let Mariko and the spirit of Zumba lead you to a fit and fun lifestyle! Zumba combines Latin and International music with a fun and effective workout system. Whether you are an exercise fanatic or just looking for some summer fun, Zumba is designed to encompass all levels of dance and fitness experience. The routines feature interval training sessions where fast and slow rhythms and resistance training are combined to tone and sculpt your body while burning fat, and most importantly, having fun! Mariko brings 20 years of formal dance training in ballet, modern, hip hop and Latin to her unique and vibrant Zumba classes. Let’s get it started! Franklin Kids Day 2011 from Aulistar Mark on Vimeo. We are currently accepting submissions for short films, animations, and artist films under 18min. Please visit thecrownfilms.com for application form and submission instructions. - A nice write-up of the extremely important work that SOS Crown Heights is doing to stop violence in our community on the NYT blog CityRoom. - The Journal covers the unveiling of P-Tech (formerly Paul Robeson High School), in which the DOE will partner with IBM to offer a six-year program to high school students that will lead to an associate's degree in computer science and a fast-track to an IBM job. For the remainder of the exhibiton the public is invited to linger and use the artwork as their own gathering place. - Also on Saturday, the Built in Brooklyn Craft Fair returns to LaunchPad from 12-6pm. - On Sunday (August 7), Heart of Brooklyn presents a Free Summer Sunday, with no-cost admission to all six of their partner institutions (The Brooklyn Museum, the Children's Museum, the Prospect Park Zoo, the Botanic Garden, the Brooklyn Public Library, and Prospect Park - and yes, admission is always free to the last two). 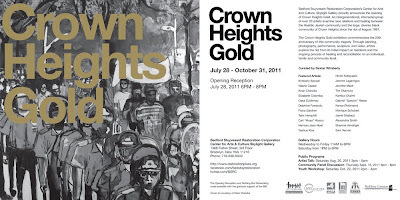 - NY1 sent cameras to cover the opening of the Crown Heights Gold exhibit, where the Brooklyn Historical Society will be hosting an Artist Talk on Thursday, August 11. - Chabad.info has a fascinating article and interview documenting the role of the Crown Heights Jewish community in supporting their brethren as they were persecuted by the Soviet Union. - The FP Reading Series returns on Monday, August 15 with "Missed Connections." - Even further down the line, the Washington Avenue - Prospect Heights Association hosts Wash Ave Rocks, featuring food, fashion, and family-friendly events, on Saturday, August 20th. - And finally, one that I meant to post ages ago, an in-depth look at Steve the Tree Branch Breaker that's definitely worth a read (thanks to MikeF for the tip).